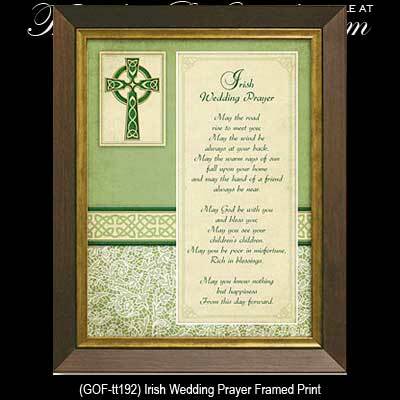 This Irish blessing plaque features a wedding prayer with metallic foil stamped details that include a Celtic cross and knot-work. The composite frame is made with the look of wood and the print is under glass. The Irish wedding blessing measures 8" wide x 10" tall and it is ready to hang on the wall or stand with the included attached easel and hanger. The Irish wedding plaque is gift boxed with Celtic knot and Celtic cross history cards that are complements of The Irish Gift House.